(CNN) -- New Mexico Gov. Bill Richardson is withdrawing his nomination to be commerce secretary, citing the distraction of a federal investigation into ties to a company that has done business with his state. Gov. 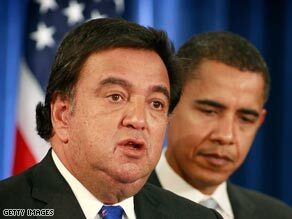 Bill Richardson said a probe focused on him would delay work toward bettering the economy. Speaking to reporters Monday, he said that he underestimated how long the investigation would take, calling it an "untenable delay" likely to hinder his confirmation process. Two Democratic officials told CNN the investigation involves a California company that won municipal bond business in New Mexico after contributing money to various Richardson causes. In a statement Sunday, Richardson said he asked President-elect Barack Obama "not to move forward" with his nomination. Obama released a statement saying that he accepted the withdrawal with "deep regret." "Governor Richardson is an outstanding public servant and would have brought to the job of Commerce Secretary and our economic team great insights accumulated through an extraordinary career in federal and state office," the statement read. "It is a measure of his willingness to put the nation first that he has removed himself as a candidate for the Cabinet in order to avoid any delay in filling this important economic post at this critical time. Talking to reporters Monday, Richardson said, "Yesterday I was hurting over this decision. I lost a Cabinet appointment." "But I think we have to focus on what people are losing in this country," he said, referring to heightened U.S. unemployment. "Mine is minor compared to that," he said. Richardson did not offer details of the investigation or the company involved. Two Democratic strategists outside Obama's transition team told CNN that Obama aides pushed the withdrawal because they did not want an ethical distraction amid the controversy surrounding embattled Illinois Gov. Rod Blagojevich. Federal prosecutors allege that Blagojevich, a Democrat, had hoped to barter Obama's Senate seat for either money or influence. One of the strategists described Richardson as "stunned." But Democrats who talked with CNN noted the withdrawal is in keeping with the Obama philosophy of resolving issues quickly. iReport.com: Do you trust your political leaders? When Obama announced December 3 that Richardson was his pick for commerce secretary, Obama hailed the New Mexico governor as a "leading economic diplomat for America." Obama said then: "I know that Bill will be an unyielding advocate for American business and American jobs, at home and around the world. And I look forward to working with him in the years ahead." Richardson was the third former presidential rival to join Obama's team. Vice President-elect Joe Biden and Sen. Hillary Clinton, Obama's pick for secretary of state, also competed for the Democratic presidential nomination. Richardson also was a contender for the secretary of state post. Richardson withdrew from the race for the Democratic presidential nomination on January 10, 2008, after a poor showing in the New Hampshire primary, and later endorsed Obama. Obama and Clinton both lobbied Richardson for his endorsement.